River banks and floodplains, thickets and moist forests, swamps (including cedar), wet ditches in (or by) forests and marshy ground. Tall individuals may be 1.8–2.5 m in height. 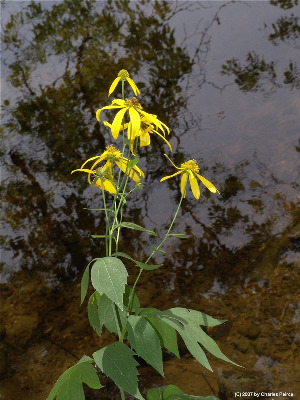 In addition to the wild plants, a garden cultivar known as “goldenglow,” R. laciniata cv. ‘Hortensia,’ derived from this species by conversion of all or most disk flowers to ray flowers, occasionally escapes. 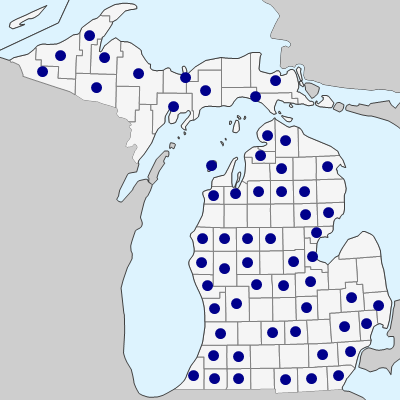 The dots on the map for Alpena, Ogemaw, and Schoolcraft Cos. and for the Manitou Islands represent only the cultivar, which is also documented as established in some of the counties from which the native plant has been collected. MICHIGAN FLORA ONLINE. A. A. Reznicek, E. G. Voss, & B. S. Walters. February 2011. University of Michigan. Web. April 21, 2019. https://michiganflora.net/species.aspx?id=437.